When we walked into Darwin last Tuesday for what we thought would be a typical medical lecture, we quickly realised that this was not going to be a sit down and listen type of experience. The room was brimming with medical equipment, ranging from an ultrasound machine, an iPhone that could take pictures of the back of your eye to the more familiar measuring tapes and blood pressure cuffs. Rather than watching someone else use all this excitement, we instead quickly formed small groups and began rotating. Suddenly calls could be heard from all corners of the room; “I can’t find my heartbeat – am I dead?” being the most frequent. 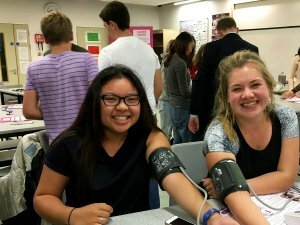 There was a definite buzz circulating; we were able to analyse our own bodies, and the bodies of our friends, in ways that we had only ever seen before in medical settings, not in our classroom. The Medical Maverick staff were on hand to help us with every endeavour from drawing blood from a fake arm to finding our kidneys using ultrasound. This is the best MedSoc I have ever attended because, not only was it extremely fun, but it was fascinating to be able to access knowledge and equipment that many of us thought was restricted until we started our medical degrees. I definitely learnt a lot about the different types of technology that medics use. The most interesting development was, for me, the iPhone eye test. It is so inventive of the medical community to embrace this everyday piece of technology to potentially save someone’s life. 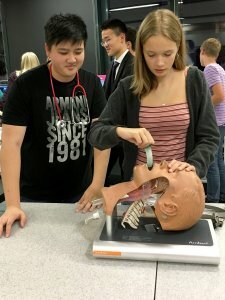 Overall it made most of us feel a step closer to becoming a practising physician as, instead of reading or watching something, we could actually experience the technologies and techniques that many of us hope one day to be utilising in the real world.